Fish sauce, called “nước mắm” in Vietnamese, is the country’s beloved condiment. According to an article published in 2016, over 200 million liters (approximately 53 million gallons) of fish sauce is consumed yearly in Vietnam. With a long coastline from North to South, facilities to produce fish sauce are set up in quite many regions of the country. Located in the South, Phu Quoc is the biggest island of Vietnam and is regarded as one of the regions with the best fish sauce. The water around Phu Quoc island is full of seaweed and plankton, providing excellent food for the anchovies, main ingredient of Phu Quoc fish sauce. Phu Quoc is also where one of the world’s purest fish sauce, Red Boat, is produced. Having tried many different brands in Vietnam as well as in the US., to us, Red Boat fish sauce is truly among the best. Before our trip to Phu Quoc island last weekend, we contacted Red Boat and asked if we could visit their factory. Mr. Cuong Pham, the founder, was in the US. so he had Ms. Hong, one of his staff on the island, give us a tour of their facility. We were super excited about the opportunity since we have never visited a fish sauce factory. More importantly, we are long-time fans of Red Boat fish sauce, having used it since way before we started this blog. 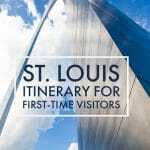 We will share with you what we saw and learned during our visit in this post. We reached their facility in Duong Dong town at around 3 p.m. Ms. Hong opened the gate and greeted us with a friendly smile. We sat down in the garden and she gave us an introduction and overview of the facility. From the conversation, we quickly realized this lady is key personnel of Red Boat production in Phu Quoc and she is very passionate about her job. Fish sauce factories in Phu Quoc are called “barrel house”, or “nhà thùng” in Vietnamese. The name signifies the traditional method to make fish sauce on this island, which is fermenting fish in huge wooden barrels. In some other areas in Vietnam, they use big clay jars instead of wooden barrels. Red Boat barrel house is set by Duong Dong river and from where we sat in the garden, we could see a small boat parked on the dock. 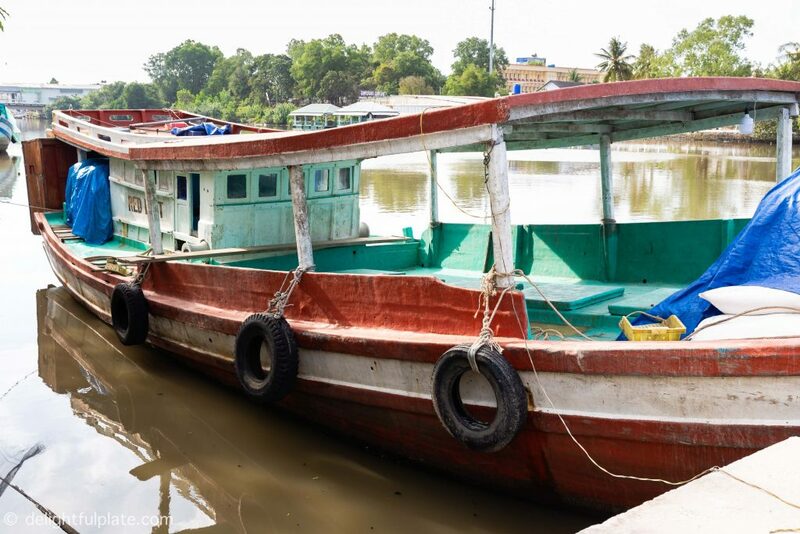 According to Ms. Hong, to ensure a constant and high-quality supply of fish for their production, they have their own larger boats that go out and catch black anchovies (“cá cơm than“) in the ocean. The smaller boats will then transfer wild anchovies from the large boats back to the barrel house through the river. This small boat can transport 25 tons (over 55,000 lbs) of anchovies to the barrel house. Having spent the first 20 years of our life in Vietnam and tasted fish sauce from different regions, I can tell you that some fish sauces can have an overly fishy and pungent odor. If you accidentally spill those fish sauces, just a few drops would be enough to reek the whole room. Red Boat fish sauce is rich in fish flavors but we find it to be much more pleasant to the nose. I asked Ms. Hong: “What makes the difference?“. She said the anchovies were salted right on the boat, within 15 minutes after they were caught to preserve their freshness until they reach the barrel house several days later. As we all know, fish that is no longer fresh stinks. Red Boat salts their anchovies when they are fresh and in their prime. 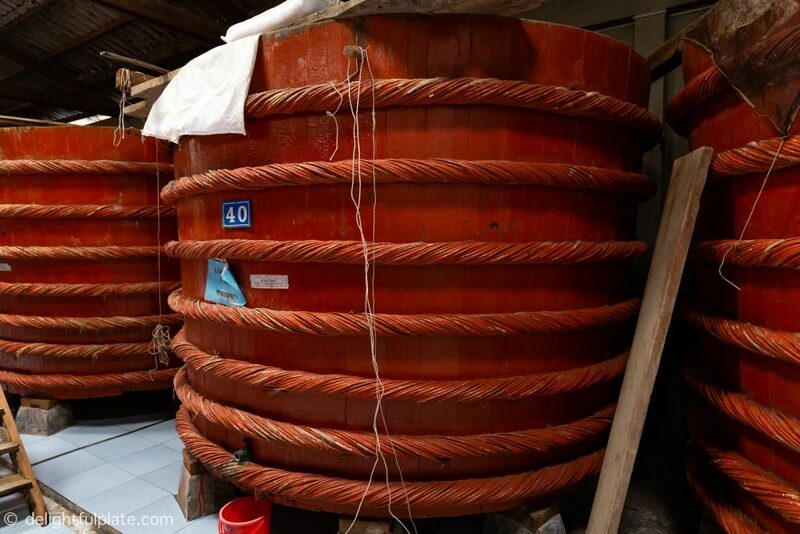 The mixture of anchovies and salt (called “chượp” in Vietnamese) will be transferred to the barrels to start the aging process (called “ủ” in Vietnamese) within 48 hours of reaching the barrel house. They sometimes need to work over the weekend to stay within the time limit. The anchovies will then be fermented for a year. This is the traditional method to make fish sauce in Vietnam and it is called “ủ chượp“. Some houses want to rush the process and shorten the fermentation time which may result in a more fishy and pungent final sauce. Ms. Hong said all those steps and rules helped them produce a fish sauce with great taste and smell. Red Boat uses white sea salt from Ba Ria – Vung Tau, which is also a Southern coastal province. I was curious about what makes Ba Ria salt the best choice for making nước mắm Phú Quốc, so I did some more reading after the visit. Ba Ria salt is dry and firm with sharp edges, perfect for making Phu Quoc fish sauce. 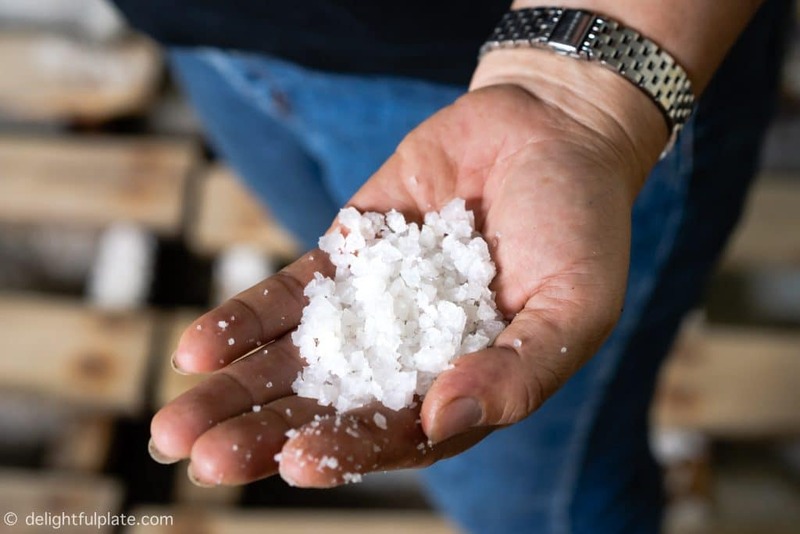 Compared to salt produced in other provinces in Vietnam, Ba Ria salt is very low in impurities, especially MgCl (magnesium chloride). Salt with high Mg2+ content may have a bitter taste and absorb more moisture. Ba Ria salt is also low in sulfur, so it does not have any yellow hue. Those characteristics make this salt the top choice to produce fish sauce with a fine taste and beautiful color. Well, it wasn’t really a peek. 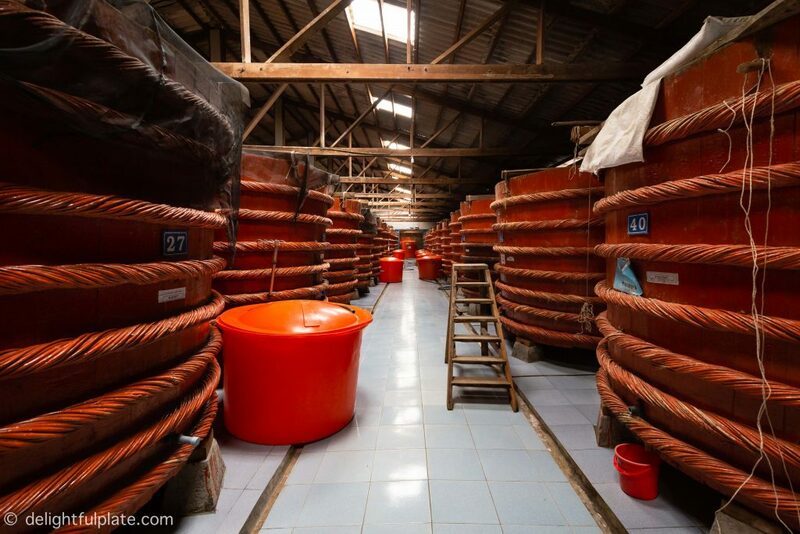 We did spend a good amount of time inside the warehouse where they store the fish sauce barrels. After our initial conversation in the garden, Ms. Hong took us to the warehouse and the moment she opened the door, we were stunned. 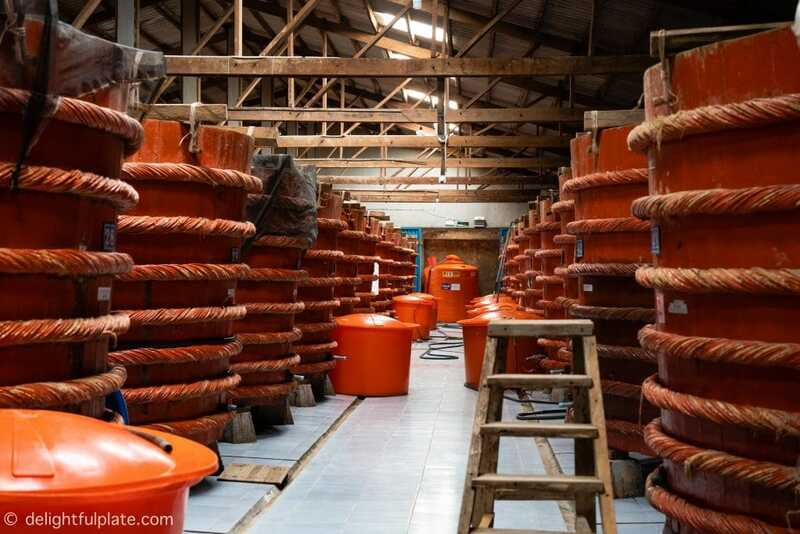 In front of our eyes were rows and rows of giant, red-orange wooden barrels containing the anchovies and salt mixture (“chượp“) in different stages of fermentation. Each barrel is probably 2 meters tall with a diameter of 2-3 meters. Very impressive! What is even more impressive to me is how spotlessly clean it is inside the warehouse. 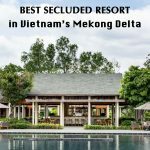 Ms. Hong smiled and said each barrel could hold 12-14 tons of chượp. She then explained the wood is from bời lời trees which can be found on Phu Quoc mountains. Using this type of wood to make the barrels enhances the flavors of fish sauce. She said when cleaned and maintained properly, these barrels could last 50-60 years. Wow! The heat at 3.30 p.m. in the warehouse was no joke. It must be around 100F and we were all sweating. Ms. Hong asked “Hot, isn’t it?”. They intentionally constructed the barrel house with a thin tin roof to keep it even hotter inside than outside. 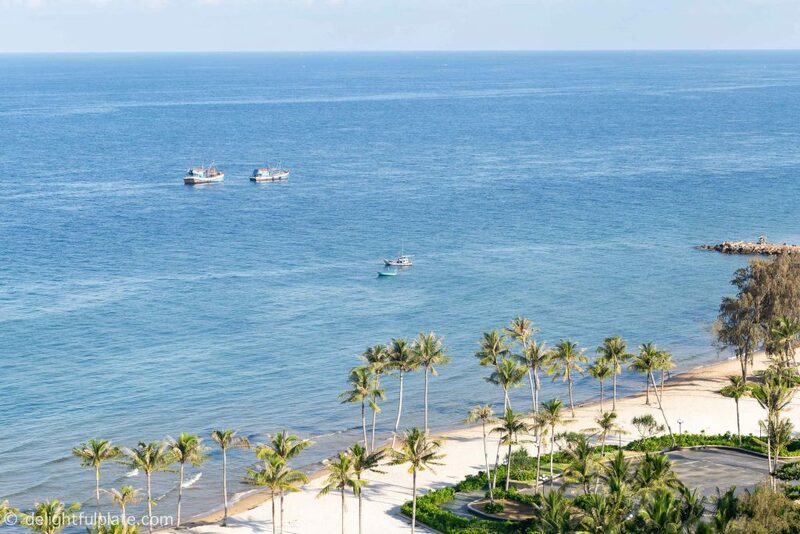 According to her, the weather in Phu Quoc is perfect for making fish sauce since it is hot all year round. The heat helps the sauce ferment properly. Yes, I’m serious. I was very surprised at how good it smelled inside the barrel house. It wasn’t stinky, pungent or unpleasantly fishy at all. The smell was pervasive, but it had nothing in similarities with the stench of rotten fish at all. If you have ever tried Vietnamese semi sun-dried fish (cá khô một nắng), I think that’s what it smells like inside the warehouse, salty, sweet and rich with scents of the sea and minerals. I think the great smell is the proof of how well they preserve the freshness of their anchovies. Red Boat uses Phu Quoc’s traditional “ủ chượp” method that dated back to 200 years ago to produce their fish sauce. 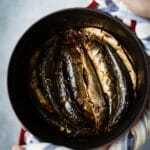 A mixture of 3 parts anchovies and 1 part salt is fermented in wooden barrels. After the initial week of fermentation, the liquid produced in the barrel will be drained and then circulated back into the barrel. They repeat this step a few times in the first 3 months, and then leave the contents inside the barrel untouched. The total aging time is a year. At Red Boat, only the first presses are tapped for sauce. We call the first press “nước mắm cốt” or “nước mắm nhĩ” in Vietnamese. First press sauce has the highest protein, best taste and most beautiful color. Each barrel can yield 3,000-3,500 liters (800-925 gallons) of first press fish sauce. It may take them 4-5 days to fully drain a barrel. Once the sauce has been drained, the fish scrap will be used to make animal feeds. They used to do bottling of their fish sauce in Phu Quoc, but this final step is now done in the US. They send samples of the finished sauce to labs in Ho Chi Minh City and Can Tho for measuring multiple metrics required to export overseas. Then they ship their fish sauce in big tanks to the US. and bottle it there. Ms. Hong told us that no two batches of fish sauce looked or tasted exactly the same. That can be because of differences between each catch. Different locations of the barrels in the warehouse can also contribute to a slight difference in taste. Also, sauces in different stages of fermentation don’t taste the same. “That’s why I need to taste every batch,” said Ms. Hong. “Tasting fish sauce is just like tasting wine (laugh).” Then she drained fish sauce from several barrels to show us the differences as well as to demonstrate how it is similar to tasting wine (and I think she’s right). Good fish sauce should have some viscosity. It shouldn’t be too watery. When tasting wine, we look at the color, opacity and viscosity of the wine. Then we smell and taste it. The process for tasting fish sauce is the same. All the samples have a beautiful deep amber color but some are slightly lighter or darker than others. Some taste slightly saltier than others. The longer fish sauce is aged, the darker it looks, the less fishy it smells and the more umami it tastes. 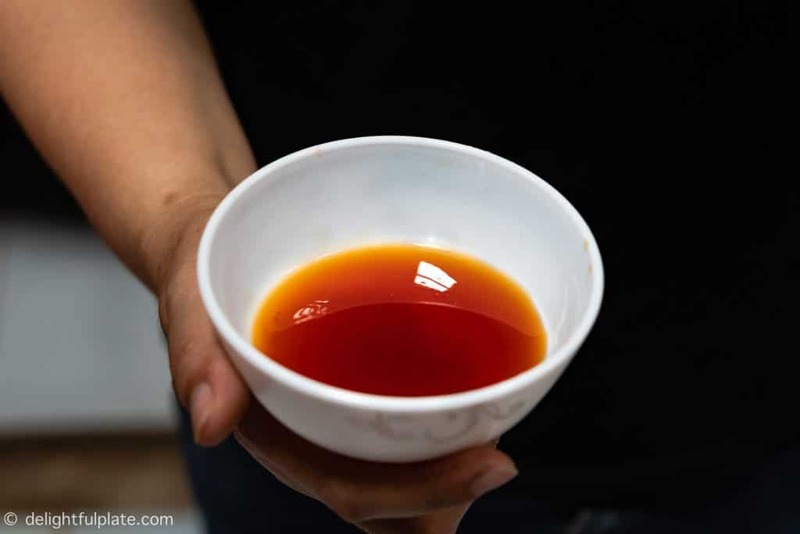 Ms. Hong let us taste fish sauce from a 9-month old batch, and though it was still slightly fishy, it already had a sweet and rich taste on the finish. The fish sauce in the top bowl has only been aged for 9 months and it has a significantly lighter color. 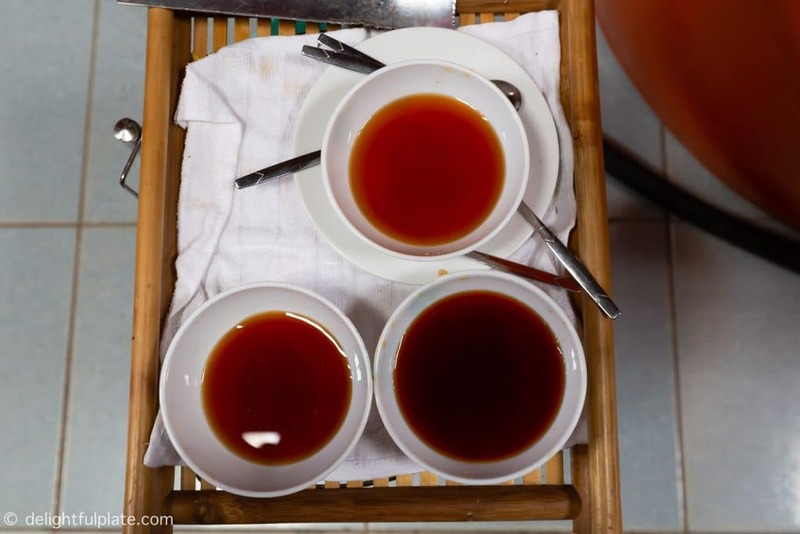 After tasting each batch, Ms. Hong would meticulously blend them so that all Red Boat bottles sold to consumers would have the same color and taste. No additional ingredients, flavorings or additives are added, they just blend the pure first press sauces from different barrels to ensure uniformity across all fish sauce bottles. From a young age, I knew fish sauce was made by fermenting fish and salt. 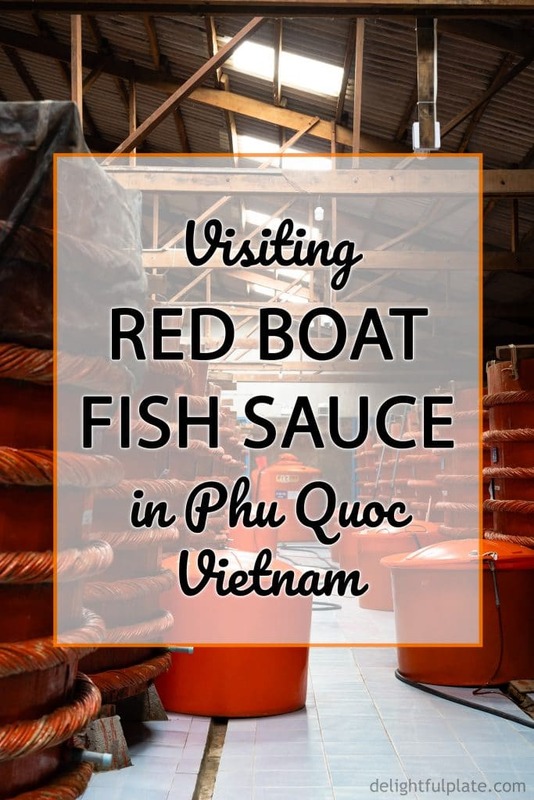 However, I didn’t know that so many steps, details and thoughts were needed to produce high-quality fish sauce until I visited Red Boat barrel house. Ms. Hong said she started the job knowing nothing about making fish sauce, but she quickly became obsessed with it. I can tell from talking with her how much she loves what she is doing. Nowadays, just by examining the anchovies hauled in, whether they are plump or skinny, she can predict how the finished sauce will taste. She and Mr. Cuong work really hard and think very hard to produce a fish sauce product that not only tastes great but also meets all standards set by North American and European countries. 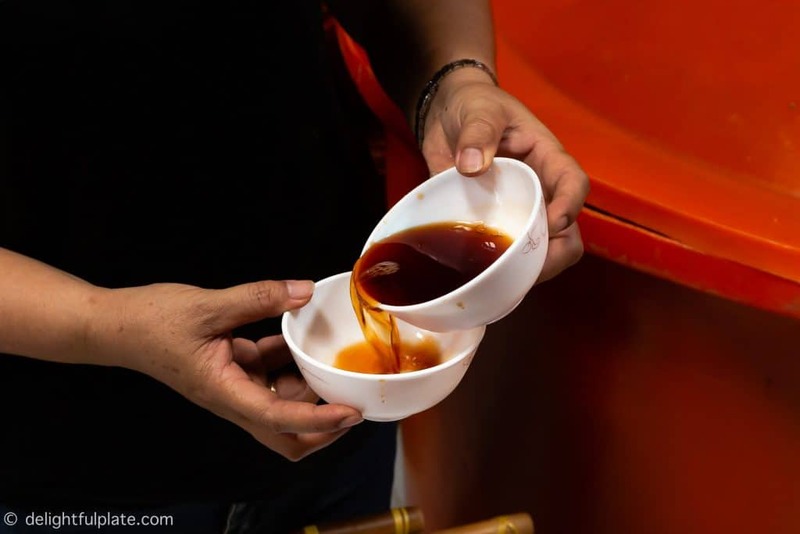 After visiting their barrel house, seeing how clean the facility is, learning about the production as well as quality control measures, and tasting freshly-drained fish sauce, we feel that we can totally trust the quality of their products. To this date, this is also the only fish sauce brand we recommend on our blog. In the US., you can buy Red Boat fish sauce at some Asian grocery stores, Costco, Whole Foods, Trader Joe’s and some local grocery stores. You can also buy Red Boat on Amazon. We have ordered Red Boat from Amazon many times. The bottles come very well-packaged and we never had leakage. Red Boat online website also has a shop page. Outside of the US., Red Boat fish sauce is also sold in Canada, Singapore, Australia, New Zealand, Hong Kong and Germany. I don’t know exactly the names of stores that carry Red Boat in these countries though. We also add fish sauce directly to season the food. Most Vietnamese recipes use some amount of fish sauce. Once opened, a bottle of fish sauce does not need to be refrigerated. Everybody in Vietnam just stores fish sauce in a cupboard at room temperature. I asked Ms. Hong why Red Boat recommends refrigerating after opening. She explained that if left at room temperature, fish sauce may get darker over time due to oxidation. 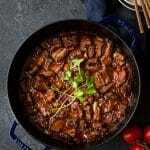 Another reason is when fish sauce is refrigerated, salt crystals, which are totally harmless, may form naturally. As a result, the fish sauce will be less salty while retaining all the umami, deep flavors. In another word, the taste will be finer. So it’s up to you to decide how you want to store your opened bottle of fish sauce. It isn’t something that can go bad easily. We would like to thank Mr. Cuong and Ms. Hong for their kindness, allowing us to visit their facility and showing us around. We also greatly appreciate their commitment to quality of Red Boat fish sauce. We were so happy to be able to visit their barrel house on Phu Quoc island and learn so many interesting things. It was such an eye-opening experience.